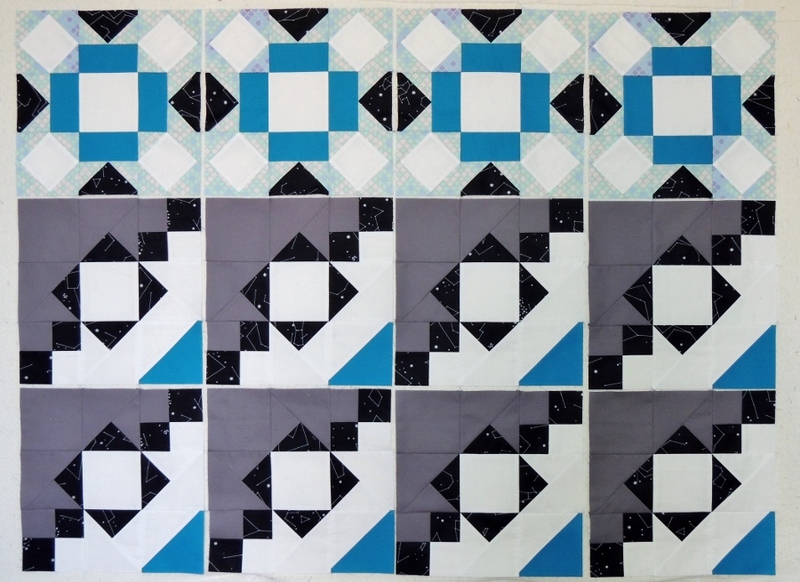 January was the last month of piecing instructions from Cheryl @Meadow Mist Designs for her Meadow Mystery Quilt Along. In February, the quilt design will be revealed and I am excited to see how all the different quilts come together! Our instructions for January were to make (4) Block 2 and (8) Block 5 12.5-inch (unfinished) blocks. I have to admit that seeing all the different layout options that are being shared in the group Facebook page has been exciting, and instead of playing with layouts myself, I decided to wait for February’s instructions as I want to keep my final layout a surprise to me for as long as possible! Have you participated in a quilt along? Even if you have not, do or would you prefer a mystery quilt along or knowing what the design will look like ahead of time? Nice colours Yvonne. I prefer non mystery quilts. The first mystery quilt I made I hated the pattern, so this is the first one I’ve done since then. Your blocks are beautiful! I didn’t play around with layouts of my blocks this month either, hopefully it will make the big reveal more exciting! Loving your color combo! That Tula PInk goes so well as a background. Me too, about the surprise. Glad I’m not the only one who savors this part. Don’t want to see how my Meadow mist quilt will look until the actual layout is given. Love the astronomical black print that you included. Yvonne, Fun, fun, fun! I love the placement of the dark fabric in both versions. This is a very versatile block. I’m generally hesitant to do mystery quilts because you just don’t know what you’re going to get. But Cheryl gives great information to help with fabric selection and she has great designs, I feel comfortable playing along with the mystery. I love the fabrics you used in your blocks Yvonne: I have mystery quilts I’ve done in the past that I really didn’t like but so far Cheryl’s are the exception. I think it helps that she is very specific about what fabrics are beside each other and she will help out with fabric selection questions. These are good looking blocks – it will be fun to see how they end up fitting together. Really like how the colours are playing well together – will be interesting to see the final layout! I’m not much of a risk-taker, so I’m more comfortable seeing the pattern first. I like how Cheryl presents her mysteries, though, so I maybe I’d enjoy hers. Your blocks are really striking! I’m definitely a non-mystery kind of girl. I like to know what the end result is going to be. I enjoy seeing the mystery develop through my friends. 😉 Your blocks are looking pretty amazing. Looking forward to seeing yours go together. I’ve done several different kind of quilt alongs and I enjoy them all. Mystery quilt alongs are probably my favorite. I go more towards wanting to know what the quilt will look like. Picking colors when I don’t know where they’ll be used is a BIG mystery for me. I don’t mind sewing a mystery quilt but want to be sure they colors will work nicely when I’m done. I like that Cheryl allows you to have a sneak peak if you aren’t into surprises, so it’s the best of both worlds. Your quilt is going to be great. Nice fabric choices. These blocks are so pretty! I love the way your fabric choices are coming together.